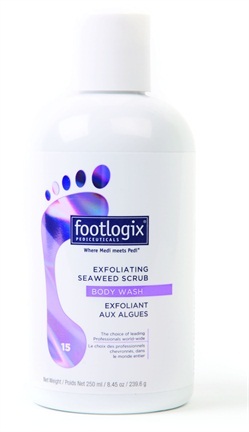 Footlogix’s Exfoliating Seaweed Scrub is created with the highest grade imported, organic micro algae. This unique formula is optimally blended with essential oils and polished pumice to exfoliate the skin without being abrasive. Uniquely scented, the lightly foaming scrub exfoliates dead skin cells on feet and legs while toning. For more information, visit Footlogix .